Successes in sports are an almost daily occurrence. A sustained lifetime of consistent success is a much more rare occurrence. 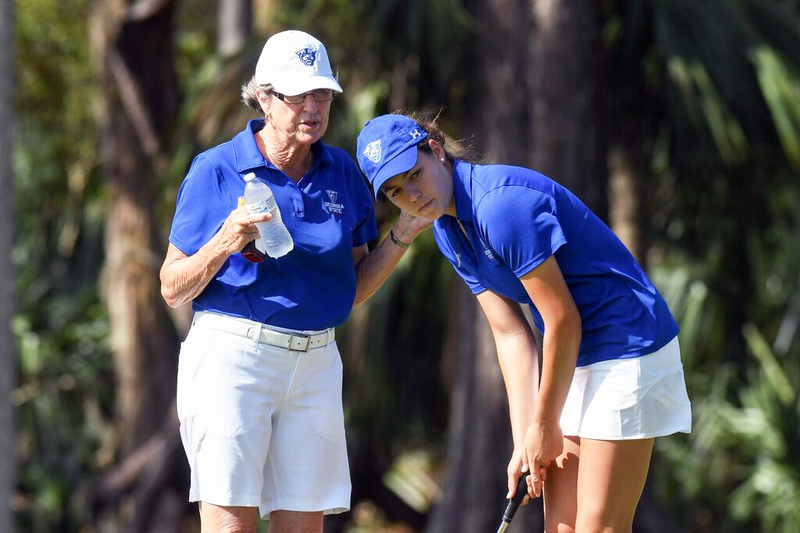 Georgia State women’s golf head coach Cathy Mant, however, defines the term “sustained success” with her lifetime of winning contributions to the game of golf. Mant has been the women’s golf head coach at Georgia State for 17 and a half years and has run up the record book over that time. Her journey to becoming the women’s golf coach with the most wins in Georgia State history did not happen overnight though. Mant, who is an Oregon native, began her lifelong journey with the sport of golf at the impressionable age of 9 years old. As a self-proclaimed jock, she chose golf in part, because in her early days, there weren’t too many other options available. That fact paired with the fact her father had begun to take a liking to the sport set the stage for the sport to quickly develop into her passion. Her passion for the sport was also accompanied by a major talent for the game, which brought her to Arizona State. “When I went to college, there were two power houses in women’s golf: Arizona State and the University of Miami, and Miami was really far away,” Mant said on her decision to be a Sun Devil. The tenure at Arizona State was a great one according to Mant, who never even visited the school before deciding to attend. These were the days before athletic scholarships and Title IX, so Mant’s decision to come to Arizona State was a risk due to the high level of competition at the university. Fortune does indeed favor the bold, and fate was on Mant’s side in college. She got her first tournament start because one of the seniors had the measles. From that tournament onward, Mant was in the lineup. Propelled by the opportunity to play at the top school in the country, Mant turned her skills into the equivalent of the NCAA title in 1970 by winning the Division of Girls and Women’s Sports Championship, an individual honor. The LPGA Tour was the next stop for the golf standout as she entered the tour in 1976, beginning a 10-year career. It was on the LPGA Tour where Mant would see some holes in her game that would later become focal points in her coaching career. “My game was good enough to be there, but it wasn’t stellar,” Mant said. Even though Mant wasn’t a superstar during her time on the LPGA Tour, it would be remiss to think she wasn’t learning and evolving the entire time. She had three major takeaways from the tour: short game, mental coaching and course management. In 1986, Mant retired from the LPGA Tour for good, and began teaching before falling into coaching. In 2000, Mant would be named the head coach of women’s golf at Georgia State. Mant brings a unique style of leadership to the team, saying she isn’t one of the “it’s my way or the highway” type coaches you often find in sports. She is a much more personal coach. Chloe Howard, a freshman standout on the team, said she really likes Mant’s ever-evolving style of coaching. “She’ll always ask what we want to do differently, how we’re feeling at practices. It’s not like every semester she asks what can change, all the time she’s asking if we’re happy,” said Howard. This style of coaching keeps the team on their toes as well as ensures each golfer feels comfortable and is in a good environment to grow as a player. With so many things accomplished in her life and 17 years at Georgia State alone, the question must be asked— what keeps Cathy Mant motivated and coming back year after year? For Mant, it’s simply the love for young people and watching them grow as people and athletes. “My joy and my energy comes from [helping the women’s golf team] and [watching them] grow from when they come in from a freshman to when they graduate— that energizes me,” said Mant. Over the past 17 years, Mant has collected numerous awards and honors for her coaching duties at Georgia State. Mant is a six-time Coach of the Year award recipient, a Grainger Award winner and led the Panthers to three conference championships in 2006, 2009 and 2010. Her golfers have brought in 21 team tournament victories, and over 20 individuals have medaled. This list of accolades is impressive, but Mant and her players fully understand that there is still work to be done and each season leaves its own legacy. This season did not get off to the start Mant wanted. Using her years of golfing experience, Mant and the team have made changes in practices, workouts and even brought in a mental trainer to stay ahead of the game. The changes appear to be working as the team has steadily improved since the rocky start to the season. The players seem to be taking Mant’s coaching wisdom to heart as the confidence has not wavered. “I’m hoping to win, individually as well as a team. I know that my team can win our home tournament. We definitely can do that,” said Howard. This confidence, in part, can be attributed to none other than Mant and her knowledge. For the accomplished Mant, she is only concerned with her players giving it their best and continuing to improve, and they are doing just that midway through the 2018 season.